"War Is the Health of the State." The title of American radical Randolph Bourne's manuscript referred to the expansion of government power during World War I, but it applies equally well to all conflicts before and since. In times of war, liberty recedes and the state expands. Even worse, the restrictions imposed during wartime often remain long after the danger has passed. To take a particularly notorious example, 94 years after the income tax was adopted to finance Canada's contribution to the Great War, it still awaits its demise. Another example of a wartime restriction, though less well-known as such, is the Canadian Wheat Board (CWB). In 1943, the Mackenzie King government decided that in order to prosecute the war, it needed control over grain supplies. Parliament adopted legislation that required all Prairie grain farmers to market their product through the CWB in the name of "financial stability, prudent risk management, and certainty of grain supply." Now, a mere seven decades after Hitler's death, the federal government has at last seen fit to reverse that decision. The change is controversial; two months ago, a majority of farmers voted in a non-binding plebiscite to keep the CWB as is. Ottawa remains unmoved, however, vowing to adopt the measure by year's end. Is the government's position not undemocratic? And why change a system under which Canada has become the world's leading producer of barley and sixth-largest producer of wheat? There is good reason why the CWB should lose its power, and on close examination, many arguments offered up in favour of the status quo are in fact powerful reasons to reform it. These arguments are not reasons to keep the CWB, but rather reasons to scrap it. As the only seller of western Canadian wheat and barley, the CWB generates valuable premiums for Prairie farmers. Under a single desk, there are no competing sellers to undercut each other's prices to the same grain buyers [...] Numerous studies by leading agricultural economists using actual CWB data have concluded that the single desk earns Prairie farmers hundreds of millions of dollars a year more than they would achieve in an open market. This claim is probably true. Sellers can often get better prices by forming a cartel―witness OPEC, for example. But what this means is that the CWB's defenders are advocating a mechanism that keeps the price of a basic staple artificially high. Normally, this is seen as highly undesirable. When it is the deliberate intention of government policy, that policy is clearly wrong. Given that rising food prices harm the world's poor above anyone else, is it not appalling that the laws of Canada are intended to create exactly that result? The irony of this argument is that the very thing it celebrates―individual producers joining together to get a better price―is actually illegal under Canadian law. Under section 45 of the Competition Act, no person may conspire, agree or arrange "to fix, maintain, increase or control the price for the supply of [a] product." The Competition Bureau explains that "cartels are harmful because they typically result in higher prices for consumers and reduce the incentive for companies to cut costs and be innovative." Curiously, those concerns suddenly disappear when it comes to western grain farmers. Of course, the CWB's activities are authorized under separate legislation and so are not subject to that prohibition. But the even richer irony is that once the law changes, any farmers who tried to re-create the single buyer system through voluntary agreements amongst themselves may well become the target of an anti-cartel investigation by the Competition Bureau. The contradiction is blatant: one the one hand, western grain farmers currently must participate in a cartel. On the other, anyone else who does so faces draconian penalties: up to 14 years in jail and $25 million in fines. The only difference is that the grain cartel is imposed by the state, whereas any other cartel would be a voluntary association of individual businesses. In other words, when the government does it, it's fine. If anyone else does it, off with their heads. The CWB argues that the new, voluntary scheme will hit Manitoba hard: its website claims that 95% of shipments passing through Churchill's port consist of CWB grain, whereas private grain companies use other shipping points for their inventory. It also cites a 2005 PricewaterhouseCoopers study that calculated that the CWB, based in Winnipeg, adds $94.6 million annually to that city's economy and $323 million to the province as a whole. "The end of the CWB's exclusive buying rights is long overdue. If an open system works for everything from corn and soy to fruits and vegetables, then why would it not work just as well for wheat and barley?" Assuming these numbers are accurate, they are either irrelevant or are in fact a reason to dismantle the CWB. To the extent that the CWB's activities will merely shift over to private business, the economic benefits will continue. And to the extent that they will not, the "economic benefits" are illusory and are actually a waste of resources. For example, if agribusiness prefers to use ports other than Churchill, it is likely because it is more efficient to do so. If the only real client of that port is the CWB, it is an indication that it does not make financial sense to use Churchill as a shipping location. If some job functions are permanently lost because no private business will pay anyone to do them, it suggests that those tasks were not producing value. Simply put, if the change results in different patterns of economic behaviour, it is an indication that the current system is wasteful and inefficient and therefore should be abolished. The CWB explains that it "partners with top-tier corporations to promote the quality and reputation of Prairie wheat to consumers around the world." Conversely, "individual companies would be reluctant to invest in branding activities that benefit their competitors as much as themselves." This may or may not be true, since in a free market nothing would stop a private business from focusing on Prairie grain and therefore building a brand around it. More importantly, this argument overlooks how the current system may actually harm the branding of Canadian wheat: it removes all incentives for farmers to try and distinguish their grain from anyone else's. Why bother developing something different if you are legally barred from marketing it? The CWB is not going to bother extolling the special qualities of any one particular farm, first because it would be too time-consuming, and second because it works on behalf of all farmers and could not favour one over the other. And yet, there is no limit to how farmers could try and carve out a niche for themselves: one on the quality of his wheat, another on his special farming techniques, a third on his environmental practices, and yet another on his use of local inputs. We will only see just how creative Prairie grain farmers can be if we give them an incentive to use their imaginations. Allowing farmers to market and sell their own grain is likely to encourage innovation and promote a variety of branding schemes, as each producer seeks to gain an edge in the marketplace. This point is self-explanatory: the CWB lobbies governments on behalf of grain farmers. Anyone concerned with the power of special interests over elected officials understands that this is a bad thing. The last reason to keep the CWB is so that it can continue working to convince politicians that they should use the state's coercive apparatus to give grain farmers benefits that they could not obtain through free exchange and voluntary cooperation. Let the Punishment Fit the "Crime"
But beyond the economic and pragmatic arguments for abolishing the CWB, the best reason to do so is the manifest injustice of the current system. 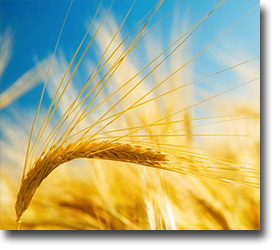 Under the Canadian Wheat Board Act, farmers who grow wheat or barley in Alberta, Saskatchewan, Manitoba and parts of British Columbia cannot sell their grain other than through the CWB's "single desk"―on pain of up to $5,000 in fines and two years in prison. This is no idle threat: in 2002, 13 Alberta farmers were sentenced to 45 days imprisonment for trucking their grain to the United States for sale. Dwell on that for a moment. Ponder it. Consider just what it means. Farmers sowed their own grain, on their own property. They reaped it themselves and personally drove their property across the border to seek willing buyers. For that sin, they were condemned to be thrown in a cage. For all practical purposes, under the existing law the grain grown by Western farmers is not theirs, but the government's―to be transferred at a price and on terms dictated by the state. And if they don't like it, they can find another way of earning a living. Who among us would accept such a restraint? Would grocers happily submit if ordered to sell food to a state-mandated monopsony? Would accountants shrug their shoulders if advised that they could practice their profession only at a single, government-created firm? Would plumbers not object if told that their services could be retained only by one lone general contractor empowered to haul dissenters off to jail? The idea is preposterous, yet that is the situation that grain producers face if their farm is in a province that forms part of what the legislation refers to as "the designated area." The CWB stresses the fact that a majority of farmers appear to be against the change. Even if true, this is irrelevant. A majority vote cannot make right that which is wrong, nor can it justify infringing on individual liberties. Even if just one lonely grain farmer wants the freedom to sell his grain to anyone he wishes, the other 99% have no right to force him to go through the board under threat of violence. The end of the CWB's exclusive buying rights is long overdue. If an open system works for everything from corn and soy to fruits and vegetables, then why would it not work just as well for wheat and barley? With luck, this is just the first step in liberalizing our archaic and misguided agricultural policies that are so costly and help make items such as meat and dairy less affordable for low-income Canadians. The Conservative government has long talked about reforming the CWB. At last, 66 years after the end of the conflict that ostensibly justified the imposition of the single desk, Western grain farmers are poised to regain what is a fundamental component of the right of ownership: the ability to sell their property freely to anyone who is willing to buy it.